I guess I need a definition of 'scam'. Literally it's a fraud, a swindle, a trick, a racket . . . The Bible Museum in Washington DC is no stranger to controversy. Founded at a cost of %500 million by the evangelical Christian billionaire Steve Green, last year Green's company had to pay a fine of $3 million and return thousands of artefacts smuggled illegally out of Iraq. Now his museum has been forced to withdraw its prized exhibit, fragments of what were claimed to be the Dead Sea Scrolls. The Museum had sent 5 of its 16 fragments for analysis testing. Guess what? The lab returned the fragments with a note stating categorically that they had "characteristics inconsistent with ancient origin". I'd have thought that any Museum alleging authenticity would have sent samples for testing before putting them on display. But then there have been many other incidents of evangelicals getting caught with their pants down! personified the most characteristic excesses of the nineteen-eighties—the greed, the love of glitz, and the shamelessness—which in their case were so pure as to almost amount to a kind of innocence. a liar, an embezzler, a sexual deviant, and "the greatest scab and cancer on the face of Christianity in 2,000 years of church history." But once you taste the forbidden fruit, Swaggart found it difficult to give it up. He was found again cavorting with a prostitute in 1991. Yet he's still on the evangelising kick, as are his wife and two children. How some of the American public fall for these charlatans totally beats me! He wasn't exactly on the ball re North Korea either, was He? 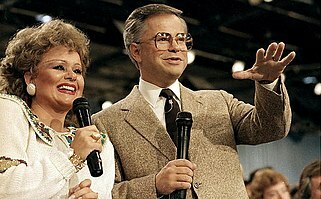 Watch from 1'44"
fountainhall wrote: You'd think after his 8 years in jail Jim Bakker would have seen the error of his ways. Meanwhile he is still raking in money from the idiots.